To cover Hilo and East Big Island in 3 days requires splitting up East Big Island into 3 geographical areas. Day 2 is a mix of very different sights as well as a road trip. Many tourists don’t venture south beyond the Volcano National Park, and that is a shame. Looking at a map you will see that Highway 11 to Volcano National Park continues south and around the Island. As you continue south, there is less and less to see. If it wasn’t for the great vista of South Point, there would be no reason to go that far. But it isn’t THAT far. The beauty of a three day visit is that this middle day can be more relaxed. 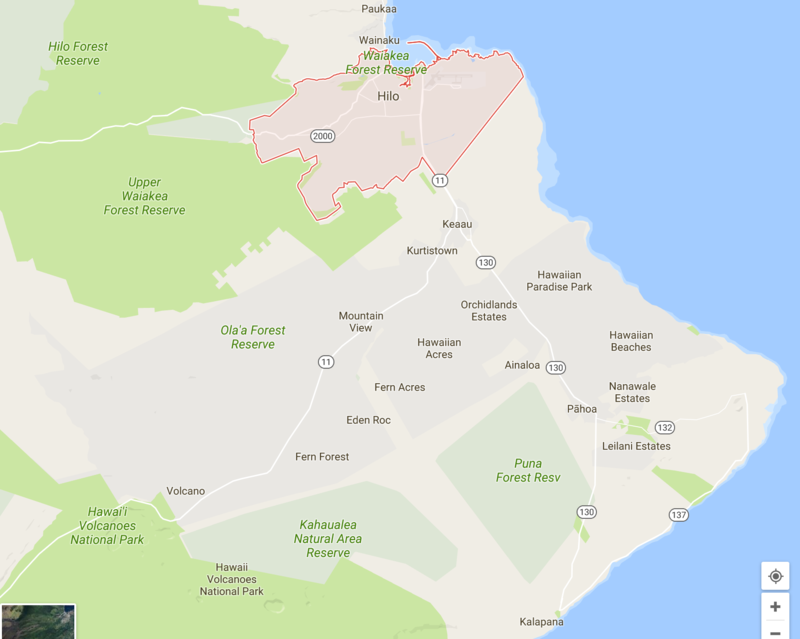 If you compare the “Hilo in 2 Days” to this “Hilo in 3 Days” I split the 2nd day and expand it. In the “Hilo in 2 Days” visit one goes up highway 11 to Volcano National Park and no farther. Then drives back down and around through Puna. This is difficult to do in one day. In a 3 day visit we leave the Puna leg for day 3 and continue south to South Point. Stop 1 – Hilo Coffee Mill. There are two coffee mill choices in East Big Island. If you want your coffee early, your first stop is Hilo Coffee Mill. If you like coffee early this stop is just 15 minutes up Highway 11 and will be your first stop. It consists of a coffee shop and gift shop in one house and a peek at their milling room next door. It is right off highway 11. See my post at: https://hilovacationhomes.com/activity/hilo-coffee-mill/. If you want to view a larger, nicer coffee mill and can wait until the afternoon, skip this stop and wait until the Ka’u coffee mill beyond Volcano National Park. Stop 4 – Thurston Lava tube. While still in the National Park drive back to the visitors center and make a right. You will see signs for Thurston Lava tube. Parking can be a pain. It is a small tube, and not that exciting. It is free and the walk down to the tube is through lush rain forest type ferns. Very beautiful. A better lava tube is planned for day 3 and its right in Hilo. To see by post on Thurston Lava tube click https://hilovacationhomes.com/activity/thurston-lava-tube. Stop 5 – Ka’u Coffee Mill. After leaving the park you will make a left, continuing south. You will soon be at your highest elevation of about 4,000 feet around the 30 mile marker and start your decent to the ocean. Nothing much to see except the slops of Mauna Loa to the right. After you are closer to the ocean you will see the ocean to your left. Your first stop is the town of Pahala and the Ka’u coffee mill https://kaucoffeemill.com after the 51 mile marker. You can also wait to see this on the way back, but they close at 5. You will see signs for Ka’u coffee and Pahala. It is cute to go through small Hawaiian towns and appreciate their simple livelihoods and small schools and stores. Follow the signs. You drive a couple miles down a small road until you reach a rather large coffee operation. The whole area is very pretty, which is why this trip is worthwhile. Driving back to Hilo gives you time to see if there is any entertainment at the Paradise Theater. For dinner, try the Hilo Bay Cafe hilobaycafe.com ,but only if you can get an outdoor table! Today we travel back up highway 11, but quickly turn south on Highway 130 to investigate Puna and see the lava flow into the ocean. Viewing the lava is best done as it is getting dark. Start riding while it is still light, but later in the day so you can see the lava as it is getting dark. You can ride back in the dark. Make sure the place you rent the bikes from provides a light. You need a light or you will be walking the bike back! Stop 1- Hilo Zoo (Panaewa Zoo) It may seem odd that one spends time going to a zoo? Not here. See my post at https://hilovacationhomes.com/activity/hilo-panaewa-zoo/ Just a couple miles above downtown Hilo you will see the sign on your right side. Turn on Stainback Highway and go just 1/2 mile down to the zoo. It is close, free and pretty. Just spend 30 minutes on a leisurely walk before heading on. Stop 2 – Mauna Loa Macademia Nut Factory. See post at: https://hilovacationhomes.com/activity/mauna-loa-macadamia-nut-company . Less than 2 miles up Highway 11 on your left side is your turn for the Mauna Loa Macademia Nut Factory. Unless you get sucked into their chocolate gift shop, you don’t want to spend more than 15 minutes here. The only exception is if it is lunch time. Their cafe and the beautiful surroundings are great for a bite to eat. There is lots to do, and this is NOT a highlight despite the tour buses you might see. Stop 3 -Transfer station lava flow. See post at: https://hilovacationhomes.com/activity/pahoa-transfer-station-lava-flow/ About 2 miles above the nut factory is the intersection for highway 130. You will go down until you enter the town of Pahoa. As you enter, stay to the right on the smaller road. If you went straight and into a turnabout, you can make a right and end up on the hill side of Burger King. After a few hundred yards turn right on Apaa street. The transfer station (dump) is after the left bend. See the lava as it flowed through the fence and came within yards of overcoming the area. Stop 4 – Drive through Pahoa. Drive back to Keaau-Pahoa road and turn right to continue. This will take you through the hipee town of Pahoa. Don’t blink, you might miss it. Lunch outside at Kaleo’s Bar and Grill is great. Just beyond that is the Sacred Heart Church. Just beyond the church is the intersection of highway 130 and 132. If you only have time to bike to the lava flow, turn down highway 130 and do that, if you have a couple hours to kill, go down highway 132 for the scenic route to the Kalapana Lava Viewing area. Stop 5 – Lava Tree State Monument. Just two miles down 132 to the left is Lava Tree State Monument. It is a cute pathway with forms of lava like tree trunks. It has mostly non native plants, but worth a quick stop if you have time since you will be passing right by it. A note about Champagne Ponds. Just after you turn onto 137 you will see roads toward the ocean that lead to Champagne ponds tide pools. The parking is almost non existent with no bathroom facilities. The place isn’t built as a beachpark. The tide pools certainly are a sight, but great snorkeling aren’t in tide pools. There is better snorkeling in Hilo at Richardson’s Beach park (with bathrooms, lifeguards and some sand). Stop 6 – Ahalanui State Park (Warm ponds). Continue down 132 until a sharp right turn on highway 137. About 3 miles down 137 is Ahalanui County State Park. See my post at: https://hilovacationhomes.com/activity/ahalanui-beach-park-warm-pond. This is a body of water/pond that gets warmed by a thermal vent. The amount of warmth depends on the tide. It has received good reviews, but I have been there and it didn’t seem special to me. It is worth a quick look if you have time. Stop 7: Isaac Hale Beach Park and scenic drive to Kalapana Lava Viewing Area. It is a 30 minute drive down the coastal road 137. You can stop at Isaac Hale Beach Park, just a mile from Alahanui State Park, or simply continue. Isaac Hale Beach Park has a small boat ramp and pier and is where you would meet to board a boat to view the lava. Kalapana Lava Viewing Area and Lava Viewing: When you are at the end of Highway 130 you have a choice. If you don’t have time or energy to bike 8 miles on gravel roads (some hard pack and some not), just observe and walk up the road to see how lava smothered a whole town during the ’80s. If you are biking to the lava flow, keep in mind that some of the best viewing is at night. So even if you arrive at 7:00 you are fine. The access road is open until 9:00 and you can get back any time. This might be the only time in your life to see actual lava, so make the below a priority. If you are renting a bike, make sure you have light if you are returning at night. This is an 8 mile round trip, but it is mostly flat. I’m in decent shape and I could have raced there in 15 minutes. My wife is in horrible shape and she struggled. We got there in 40 minutes. The average couch potato can do it somewhere in between. This will be the highlight of your Big Island stay. See my post at: https://hilovacationhomes.com/activity/kalapana-lava-viewing-area/ See my post about other ways of seeing lava at: https://hilovacationhomes.com/hilo-east/see-lava-flow.